Become a Part-Time Interviewer for Vericant! Develop your soft skills and gain expert interviewing ability. When you interview for a job or for school in the future, it will be a walk in the park. 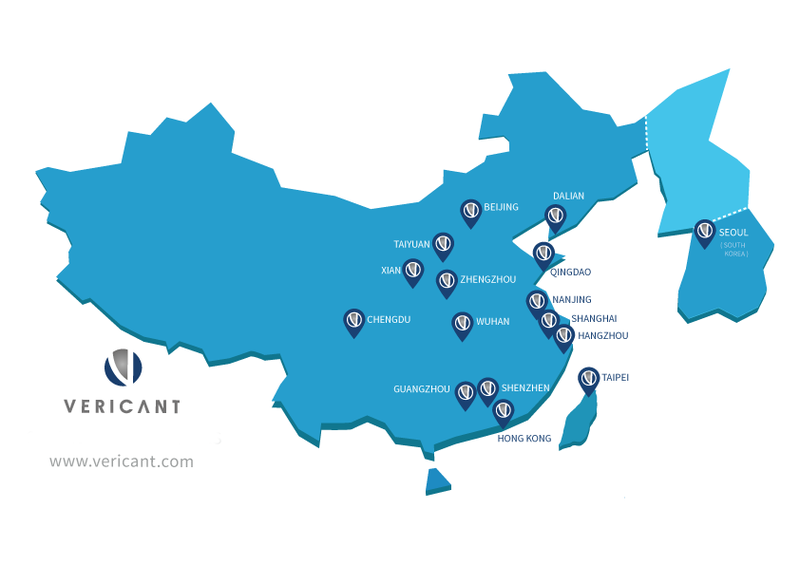 Diversify your resume by working with a company that has a presence in 13 Mainland Chinese cities, Hong Kong, Taiwan, and Seoul. Have a schedule that doesn’t force you to be in an office every weekday from 9 to 5; you’ll have the time to write a novel, build a website, or review your flashcards. Vericant’s part-time interview schedule provides me with intellectually stimulating work and a nice way to make extra cash. I also enjoy gaining a boots-on-the-ground view of the China admissions industry. Interviewing allowed me to meet students of various socio-economic backgrounds, English levels, and with differing experiences as the season progressed. Being a Vericant Interviewer is both challenging and required me to use and develop a range of interviewing techniques. If you're ready to join us, click here to start your application! Will each week’s/month’s schedule be the same? Generally, each week will be different. If you have specific preferences (for example, you would prefer to be scheduled earlier in the week rather than later in the week) let us know when we are doing the scheduling and we are happy to work that into our plan. Our interview manager will always get your approval 3-4 weeks ahead of any proposed schedule before committing you to those shifts. How big of a time commitment will this be? It is anywhere from 2 to 12 full days per month, from September to March. September to March is our busy season, with the busiest times occurring from October to January. Although interviewers are also needed outside of our busy season, typically most of the work is on the weekends outside of our busy season. We prefer people who can be available for roughly 2 days per week as this makes scheduling easier and your interviewing skills stay sharp, but your actual work time may differ based on your schedule and our demand. Some of our part-time interviewers work for us twice a month and some of our part-time interviewers work for us three times a week. The most successful part-time interviewers have been those who are in charge of their own schedules. People who work as freelance graphic designers, web developers, yoga teachers, and online English teachers have been successful. There are all people who control their own schedules. If you are trying to balance a full-time job alongside a role as a Part-Time Interviewer it is more challenging, but we have had several interviewers in the past that only worked for us on Saturdays and Sundays, handling their primary job on weekdays. What if I am only available for a few hours each day? We ask that interviewers commit to either half days (either mornings or afternoons) or full days (roughly from 9 AM to 5 PM). Full days are much better for Vericant to work with. Does this job offer a visa? We do host full-time staff for visas, so please do check out our other open positions if you are interested in joining our team in a full-time capacity. As part-time contractor work, Vericant doesn’t provide any visas for Part-Time Interviewers. There are a number of perks that are available to part-time staff other than visas, such as discounts on language classes at certain local Mandarin schools, discounts on gym membership, and discounted air masks. If you become a Part-Time Interviewer, Vericant can provide all the information you need in order to use these discounts. Will I have a script to follow? We provide our interviewers not with a script but with a guideline. Each section of the interview starts with a single question to establish a theme or a topic, and all of the rest of the questions during that section are follow-up questions that the interviewer comes up with in response to the applicant’s answers. This means that interviewers are constantly listening attentively and thinking on their feet. These personalized follow-up questions, combined with the many different guidelines that we have, means that each interview we conduct is unique. English isn’t my native language, but I am totally fluent. I speak English really really well, and I’ve even lived in English speaking countries before. Sorry: although I’m sure you’ve worked hard to reach this level of English, we need people who speak English as their native language, not as an advanced foreign language. Do interviewers have to travel to other cities? No, each interviewer will only do interviews within the city that he or she lives in. What if I don’t live in Beijing/Shanghai/Shenzhen? Can I still do interviews for you? At this time, we are only looking for interviewers in these three cities. If you don’t live in one of these cities, it simply isn’t possible to work for Vericant as an interviewer. We do three days of paid in-person training, as well as a few hours of “homework.” Part of the training is solo, part of it is one-on-one with an experienced interviewer, and part of it takes place in a larger group. I do some SAT tutoring/essay writing/college counseling for students in China. Will that be a problem? At Vericant we take our neutrality very seriously, and we don’t allow interviewers to have any contact with the students outside of the interview day. This means that if you do other work that involves helping students prepare to study abroad, this is a serious conflict of interest with interviewing work for Vericant: your role as a helper to the student and your role as a neutral interviewer for Vericant are incompatible. Many interviewers have taught English at some point during their careers, but no interviewers are allowed to engage in any kind of action to assist students in their application process. What other benefits are there to working with Vericant? In your time conducting interviews for Vericant, you will hone the skills that will help you succeed in future interviews of your own. Future job interviews or future grad school interviews will be a breeze. Vericant employees also get discounts for a handful of local restaurants, language schools, fitness plans, and other companies. Once you are hired, you can inquire about how to use these discounts.